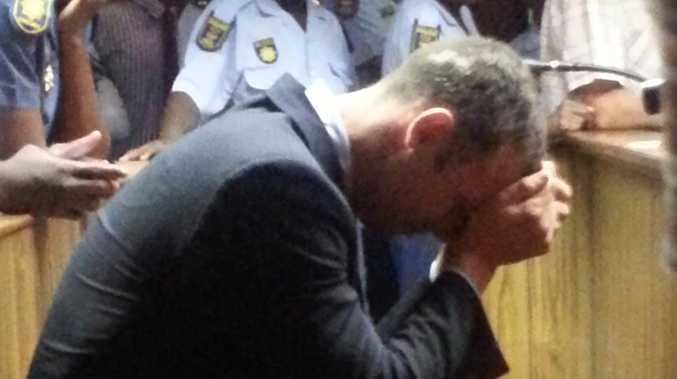 OSCAR Pistorius is reportedly refusing to eat prison food for fear of being poisoned by other inmates. The former Olympic athlete, who is serving a five-year jail term for shooting dead his girlfriend Reeva Steenkamp, is instead subsisting off canned food, The Times reported. The 28-year-old is said to be consuming a diet of tinned spicy vegetables, known as chakalaka, which he purchases from the on-site shop at Kgosi Mampuru prison in Pretoria. Pistorius' limited food intake has caused him to lose weight to the point that his prosthetic legs no longer fit properly. His paranoid behaviour allegedly follows a series of death threats made toward him, according to the newspaper's South African correspondent, who cited the country's You magazine. Another prisoner appeared to confirm that Pistorius, who is in a single cell, is at risk, telling the magazine: "Oscar never walks around without a guard, for example. He never mingles with other inmates." But the prisoner said that Pistorius is actually having an easier ride because of this: "He doesn't know what it's really like in jail. You feel it only when you're in my section - here where people fight and stab one another." Brian Webber, Pistorius' lawyer, told The Times that Pistorius has indeed lost weight but he was unaware of any death threats. Pistorius has always maintained that he mistook Steenkamp for an intruder when he shot her four times on Valentine's Day 2013. He was cleared of murder but found guilty of culpable homicide. Last month it was revealed that Pistorius has been upgraded from a category B to a category A prisoner, meaning that he now enjoys more privileges, such as more frequent visits. The decision was made on the basis that he poses little threat to security. It is expected that he will be released in August to spend the remainder of his sentence under house arrest. Next week Pistorius' lawyers will challenge a judge's decision allowing prosecutors to attempt to upgrade the runner's conviction to murder. His case will return to court on 13 March, after Judge Thokozile Masipa granted prosecutors permission in December to take the case to South Africa's Court of Appeal. If the Supreme Court of Appeal is persuaded by prosecutors and finds that Pistorius should have been found guilty of murder, he faces a minimum sentence of 15 years in prison. A date has not been set for any Supreme Court appeal by the prosecution.